In a briefing organized in Congress in July of 2007, I submitted a plan to the U.S. House Caucus on Counter Terrorism called "Freedom Lines" suggesting a second phase in the American military campaign in Iraq. This plan had been suggested as early as 2004. After having analyzed the long-term goals of al Qaeda and the Iranian regime in Iraq and discussed them with CENTCOM officials and National Defense University professors, the proposed plan projected a rapid training and expansion of the Iraqi armed forces followed by a gradual redeployment of U.S. and coalition forces out of the cities and urban zones. Today we see the first phase of withdrawal beginning to take place. It is in this redeployment stage where Iraqi forces will be taking over from Americans and allies in all cities and most towns. Two crucial questions arise immediately: Will Iraqi forces be able to control their own urban zones? And as a corollary, what should be the next phase for U.S. and coalition forces on Iraqi soil? According to the plan I have suggested, the answer to the second question can determine the success or failure of the first. Indeed, for Iraqi forces to win the battle against their security challenges, it will depend on what kind of strategic mission U.S. armed forces will be tasked with in the next stage of their new deployment. The two main forces the U.S. and the West are facing in the region, which are threatening the rise of democracy amongst local civil societies, have been and continue to be the Salafi Jihadists led by al Qaeda on the one hand and the Ayatollahs' Pasdaran on the other hand. These two threats—regardless of how various U.S. administrations perceived them or projected them—are the main challengers to Iraq's national security. Thus their intentions toward Iraq's future will determine the fate of the post-redeployment stage. What are al Qaeda's and Iran's plans with the completion of American pullout from the cities? The combat jihadists (often called "the extremists" by the U.S. administration) are clear in their intentions: attack Iraqi forces, civil society and foreign presence mostly in Sunni Arab areas and when possible across the country. There will be no change in strategy for al Qaeda but an increase of activities in an effort to crumble the government's presence in what the Salafi Jihadists would want to transform into a future "emirate." The Iranian factor is more complex: Tehran's influence in Baghdad is projected to increase. Behind the scenes, the pro-Khomeinist politicians in Iraq will pressure the Shia-dominated government to lessen their alliance with the United States and tighten their cooperation with the "Islamic Republic of Iran." The real battle will be within the Shia community of Iraq. The Pasdaran's tentacles will attempt to eliminate the anti-Iranian cadres and consolidate the pro-Iranian groups, including the armed ones. The far goal is undoubted: spread indirect Iranian control from border to border to connect with Syria's. 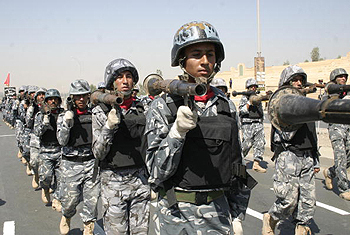 Can Iraq's government and armed forces resist the post-U.S.-redeployment assault by al Qaeda and the further infiltration by the Iranian regime? The answer is yes, if. If the country's national leadership stays united, closely allied to the United States and aware of the two threats, it will be able to ride the dangerous waves and reach stability by 2011 and beyond. But if the Iraqi government—and its successor after the fall elections—fails in meeting the three above-mentioned conditions, the threats will prevail. Do Iraq's army and security forces have enough numbers, equipment and training to respond to al Qaeda? Technically yes. If backed by their government, they can withstand terror strikes as long as needed and deny a repeat of Fallujah. Violence will take place, and might even increase, but the measurement is by the ability of the armed forces to deny the terrorists a territorial control, not to stop the bombings. However, Iraq's ability to maintain unity against al Qaeda is based on its ability to deny further Iranian infiltration. And to do so, Iraqis need to be shielded from penetration coming from the east and the west: Iran and Syria. This is where the U.S. role becomes critical. New redeployment: deterrence or neutrality? If the U.S. forces leaving cities would regroup in large bases and await calls from Baghdad's government to help when needed, they risk missing the bigger of the threats: a strategic penetration by Iran from border to border. Americans may be called to assist against al Qaeda while the Pasdaran will be subtly occupying the country. In short, we will be doing the dirty job for the next dominant power: Iran. All depends on the deals already cut. If the Obama administration has accepted the idea of a future influence by Iran in Iraq in return for a deal on regional issues, then expect U.S. "neutrality" towards Iranian influence in urban Iraq. But if Washington perceives Iran's role in Iraq as a threat, then it should use its redeployment as deterrence against the Khomeinists. Everything else will unfold quickly. In military history, deployments have constituted half of most victories. In my 2007 plan, I suggested a withdrawal from the center of Iraq and a deployment along the borders with particular focus on the frontiers with Iran and Syria. The thick presence along the two rivers should be remodeled into thick massing along the borders to the east and to the west, leaving most of the country to its armed forces. By redeploying as two buffers facing Tehran and Damascus, significant dividends will emerge. One, Iraqis will be able to pacify the center at will without main concerns about trans-border penetrations. Two, the Iranian regime will be deterred from a thrust into its neighbor. Three, the Syrian regime will lose the land bridge it hoped to access with Iran. Four, both the Assad and Khamanei regimes will have to focus on their growing domestic issues, instead of meddling in a post-withdrawal Iraq. Although such a strategic move should have been the next logical step in U.S. plans in Iraq, Washington decision makers have been advised in an opposite direction: "Engage" Iran and Syria and cut a deal with them as to the future of Iraq. The next stage of U.S. redeployment, if directed at deterring Iran, can lead to Iraqi victory over terror. But if deterring Tehran's regime is not on the agenda, Iraq will be challenged by al Qaeda in its center and penetrated by Iran from both borders. Dr. Walid Phares is Director of the Future Terrorism Project at the Foundation for the Defense of Democracies (F.D.D.) in Washington, D.C., and a visiting scholar at the European Foundation for Democracy in Brussels. He is the author of the recently released book, "The Confrontation: Winning the War against Future Jihad."